Identification of best stock market sectors could improve trading results of short term trading strategies. But what is the definition of best or worst performance? My personal approach to this definition is that I judge it by the relative strength or weakness that is presented by the stock sectors I monitor. The main importance has the evaluation of relative strength in a short-term strategy. The day traders or swing traders will benefit the most from evaluation of best stock market sectors in today’s market. The best sectors should show relative strength to the general market and other sectors. These sectors can be traded in bullish stock market strategies. Weakest sectors could be used in bearish strategies. The typical relative strength analysis expects a comparison of two or more symbols. I personally divide the US market into two main groups that represent the shares of all individual companies that I track for possible trading. One part is technological stocks. This part of the market is represented by the Nasdaq composite index. 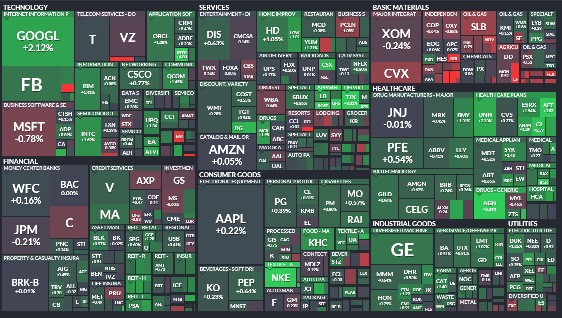 The rest of the market is represented by the S&P500 index. I use exchange traded funds for stock sector representation. I assign these sector ETFs to these two parts of the market. Like biotech ETF and technology ETFs to the Nasdaq based part and healthcare ETF or real estate ETF securities to the S&P500 part. You can check all exchange traded funds I use in my list of ETFs.